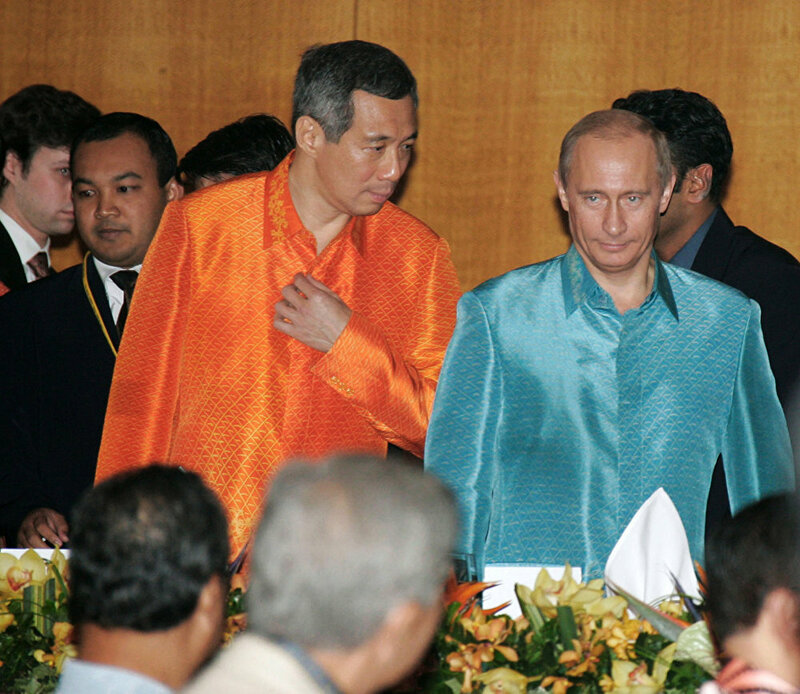 From right: Russian President Vladimir Putin and Prime Minister of Singapore Lee Hsien Loong before the official dinner in honour of the leaders of the ASEAN member states. 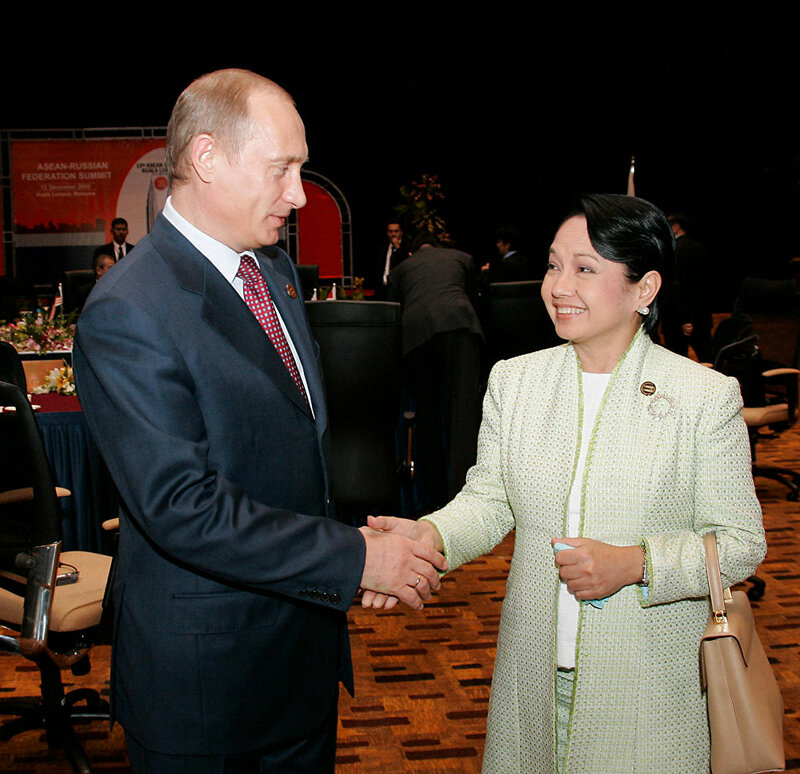 President of the Philippines Gloria Macapagal Arroyo (on the left in the foreground) and Russian President Vladimir Putin during the ASEAN Summit. Russian President Vladimir Putin (in the foreground) during the signing of the ASEAN – Russia Joint Declaration on Progressive and Comprehensive Partnership. From left: Russian President Vladimir Putin and Malaysian Prime Minister Abdullah Badawi during the signing of the ASEAN – Russia Joint Declaration on Progressive and Comprehensive Partnership. Russian President Vladimir Putin and Philippine President Gloria Macapagal Arroyo during the ASEAN Summit. From left: Prime Minister of Laos Bounnhang Vorachith, Russian President Vladimir Putin and Malaysian Prime Minister Abdullah Ahmad Badawi, photographed before the ASEAN Summit. From left : Indonesian President Susilo Bambang Yudhoyono, Prime Minister of Laos Bounnhang Vorachith, Russian President Vladimir Putin, Prime Minister of Malaysia Abdullah Ahmad Badawi, President of the Philippines Gloria Macapagal Arroyo and Prime Minister of Myanmar Soe Win during the signing of the Joint Declaration and the Comprehensive Programme of Action to Promote Cooperation between ASEAN and the Russian Federation. From left: Indonesian President Susilo Bambang Yudhoyono, Laos Prime Minister Bounnhang Vorachith, Russian President Vladimir Putin, Prime Minister of Malaysia Abdullah Ahmad Badawi and President of the Philippines Gloria Macapagal Arroyo, photographed before the ASEAN Summit.